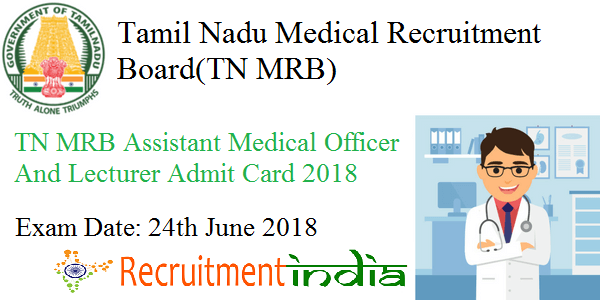 TN MRB AMO Admit Card 2018 is driven out by the Tamil Nadu Medical Recruitment Board in 14th June 2018 in order to conduct the Exam on 24th June 2018 for the posts of Assistant Medical Officer and Lecturer posts of 73 vacancies. As the TN MRB Lecturer Hall Ticket is available on www.mrb.tn.gov.in aspirants must download it and find the Date, time and location of Exam. Latest Update (14th June 2018): TN MRB AMO Admit Card 2018 has released. Download it Now. TN MRB Lecturer Hall Ticket 2018: TN Medical Recruitment Board decided to recruit 73 Assistant Medical Officer, Lecturer(Grade-II) and also announced the Notification and taken the applications from the eligible and intrested contenders. After scrutinising the Applications, the MRB Board announced TN MRB Admit Card for both the AMO and Lecturers Jobs on its portal www.mrb.tn.gov.in in June 2018. As the TN MRB Exam Date is fixed on 24.06.2018, the searching ones need to view this entire information and can Download it with the help of link posted below. And this Tamil Nadu MRB Assistant Medical Officer Admit Card is given to only the right ones among the applied and the received ones must speed up the preparation as there is less time for preparation using the Previous Papers and they should clearly check the TN MRB Exam Call Letter as it equipped with all the rules and guidelines that the postulant must do while attending the examination. As this is the important document for attending the examination the postulant must keep it very carefully until the completion of the examination and they must bookmark this page Recruitmentindia.in to know latest Jobs information also. Most of the applied aspirants are searching for this TN MRB AMO Admit Card along with TN MRB Lecturer Gr II Hall Ticket for knowing the Exam centre issued to them. Because applicants get tensed if they know about the exam hall issued. So, the TN MRB Officials will place TN MRB Hall Ticket a week before 24.06.2018(exam date) to the applicants. And this not sent through offline modes. Contenders need to Download only through Online until the Exam date only. IF the aspirants recognized any mistakes of the details placed in TN MRB AMO Admit Card immediately the person should inform the officials to get a modified copy. Otherwise, the postulant may face problems in Further recruitment. Additionally, the candidates attach the Identity proofs from the list specified and carry to the exam hall because those should be given to Verification examiners for doing candidate verification to eliminate malpractice actions which may happen. So, the candidates visit the Exam Centre on the Reporting time mentioned on TN MRB AMO Admit Card and Lecturer post call letter also. Entry will be blocked by the TN MRB Exam officials after the Reporting time. And for the Contenders who are in the exam hall at the time, they only have their examination in Online mode and they should be allotted with specified Exam Time Duration. Contenders along with this information also can find Latest Railway Openings here. Those who wants to Download the TN MRB AMO Exam Call Letter Visit the Tamil Nadu MRB main site first @ www.mrb.tn.gov.in and Open Examination Button available on the left side of the homepage and check the TN MRB Admit Card For 73 Lecturer And AMO and by Opening it and enter the essential Application/ Reg ID and DOB or Password and then click on Submit Button. And the Tamil Nadu MRB AMO, Lecturer Admit Card is displayed which is to be downloaded by the Candidates for attending the exam at respective Examination Centre.